When trees are freshly painted with their burnished fall hues, take advantage of their splendor. 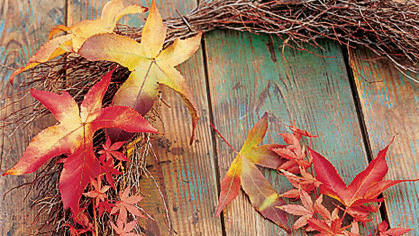 Gather some leaves and clippings to create wreaths or swags for your gates, doors, or mantels. 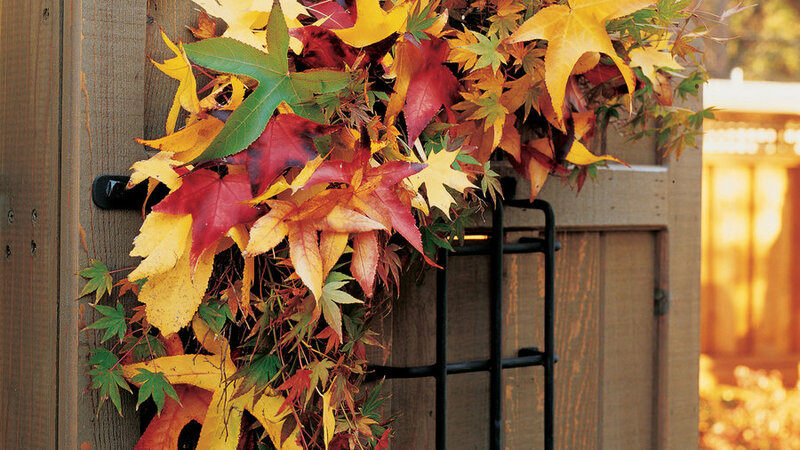 For a quick update on your porch, fill a pot or window box with the colors of the season. Bunches of Chinese pistache leaves cover this 8-inch straw wreath base (about $10 at craft stores). 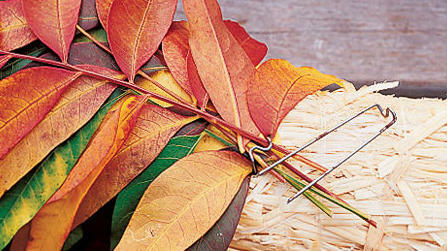 Click ahead to see how to make it and more natural fall decorations. 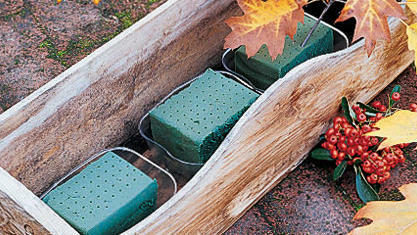 After you have collected clippings of the leaves you wish to use, gather stems into bunches of four or five. Pin the first bunch to the wreath base with a U-shaped floral pin (available at craft stores), with leaf tips facing clockwise. Place a second bunch on the base, overlapping the first slightly to cover the pins. Continue, working counterclockwise, until the base is covered. This gracefully curving swag creates a leafy half-moon on a garden gate. Japanese maple clippings and liquidambar leaves are tucked into a base of twiggy stems. If you have a birch or similar tree that drops wispy branches, you can gather several into a bunch and tie them in the middle with florist's wire. Otherwise, buy a twiggy swag base at a craft store (about $10 for one 16 inches long). Harvest about 12 maple stems, making cuts back to just above a side branch, as you would for usual pruning. 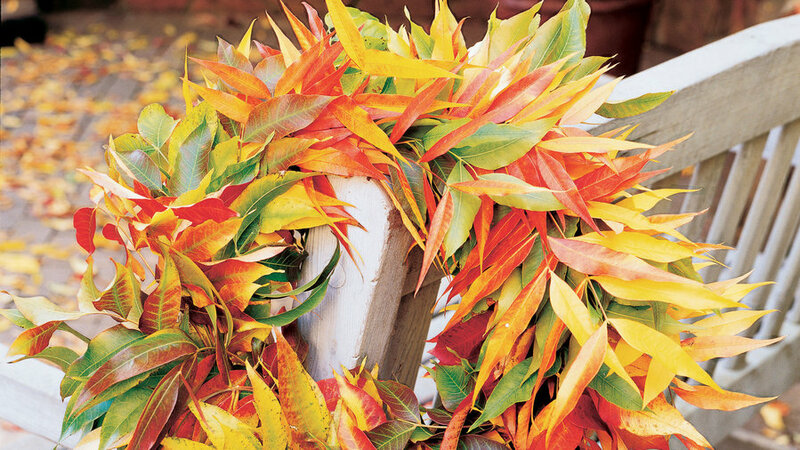 Poke the liquidambar leaves into a tied bunch of wispy branches or a purchased swag base, working from one end to the other; weave their short stems a bit among the twigs to secure them. Fill in with the Japanese maple clippings, working the stem ends into the swag base to hold everything in place. 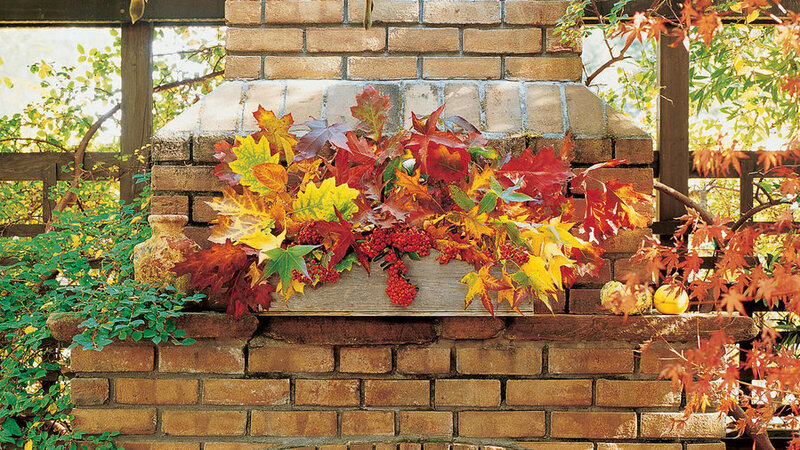 Flame-colored foliage adds just the right touch on the mantel of this outdoor fireplace. The arrangement, made of 8- to 12-inch stems of berries and leaves, fills a window box that's 24 inches long, 8 inches wide, and 6 ½ inches deep. Pin oak, liquidambar, and snowball viburnum clippings are arranged with stem ends in moist florist's foam; clusters of bright red pyracantha berries spill over the box's edges. Chinese pistache leaves are translucent enough to glow like stained glass when lit from behind. 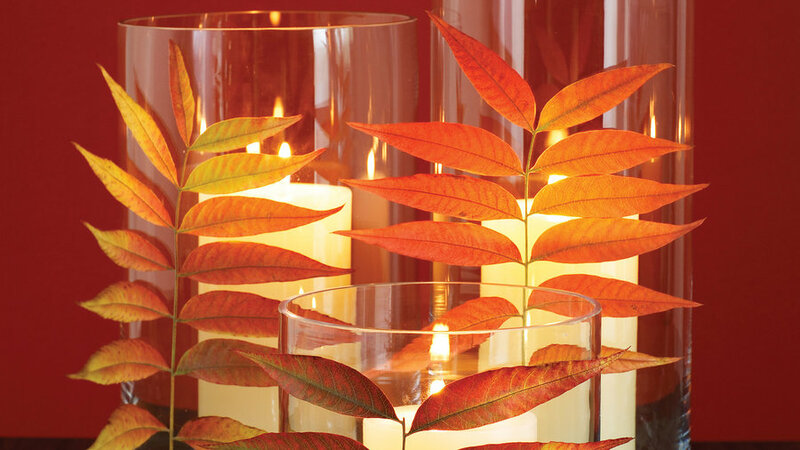 To celebrate the vivid beauty of fall leaves indoors, display them on simple glass hurricane candle holders. Press them in a book overnight to keep them from crinkling, then use one or two on the back of each stem, affixing each leaflet to the outside surface of the glass.